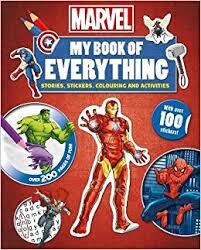 Marvel My Book of Everything is crammed with stories, stickers, colouring and activities for the ultimate Marvel fan. Join Iron Man, The Hulk, Spider-Man and all of your favourite Marvel superheroes for over 200 pages of fun! This action-packed book also comes with over 100 stickers to apply and play with.